Immigration advocates often note that asylum seekers from the Northern Triangle countries—El Salvador, Guatemala and Honduras—had to make a choice between joining organized crime or being a victim of it. 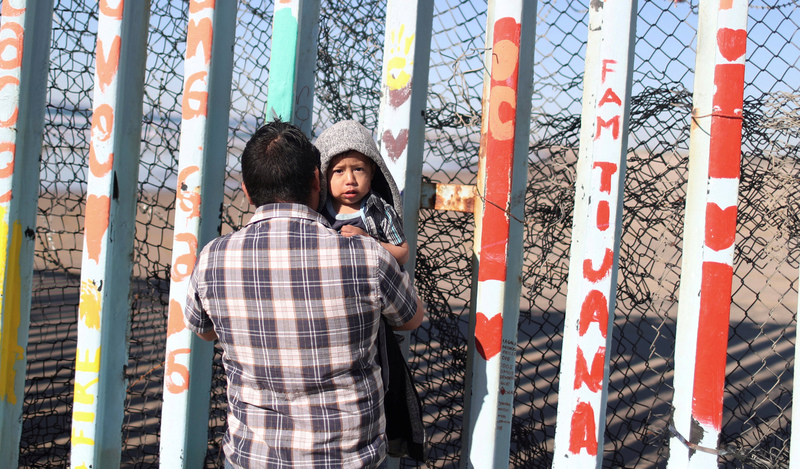 Sean Carroll, S.J., director of the Kino Border Initiative in Nogales, Ariz., told America that the number of Central American families asking for asylum continues to escalate. The simplest way to end this is to give Trump the money for the barrier. It is a very small amount, just 2/10 cents of every dollar in the budget. But the Democrats refused and shut down the government It is obvious that barriers have some effect or else the people in Tijuana would be pouring into the US. See the photo above. If the additional barrier when built has no effect then for a small price people will be able to point this out. As far as Visa over stays. Why not fix it? There are apparently ways to do so but people in Congress are preventing that too. 1. If Pelosi believes walls or barriers are immoral, shouldn't she be calling for their elimination, but she has voted for them many times? 2. If most illegal/undocumented immigrants are not coming over the Mexican border, then the wall should be harmless and ineffective to immigrants. 3. If someone is seeking asylum and comes into Mexico from the Northern Triangle nations or Venuzuela (a socialist nation - the only way to be poor despite abundant oil), then Mexico should give them asylum. If they don't stay in Mexico, then asylum is not their real motive. I am pro-immigrant, didn't vote for Trump and think the wall is a waste of money. However, the article says Trump’s proposal includes $675 million for drug detection, $800 million in humanitarian assistance and medical assistance for migrants; $782 million for an additional 2,750 Border Patrol officers; and $563 million to hire 75 new immigration judges to reduce the logjam of some 800,000 immigrant cases in limbo. And the federal workers get paid again. What's not to like? It's sad that the Catholic Church is opposed to Homeland Security on our southern Border. Perhaps if the Vatican City's own national borders would experience the same chaos and criminality, would it's Church members be of a different opinion? George---Yes, we should provide for the common defense, but a wall is not the answer. Many experts have pointed out that the wall cannot do that. We need to use high tech. Trump, who knows everything better than anyone else, does not listen to experts. He merely wants to keep a foolish campaign promise that is ineffective. Besides, I thought he said the Mexicans would pay for the wall. This is true and is another more difficult problem to solve. But that is not an excuse to not fix a problem that can easily be fixed. It’s like making a lists and scratching it off one at a time, start with the problem you can fix today and cross it off the list, then move on to the next line item. The best way to end the shutdown is for McConnell to bring the bills to open all the government but homeland security to the floor for a vote in the senate. It would pass with a majority big enough to override Trump's veto. Almost all of the gove would be opened and the Dems and Republicans couls just argue over the wall/border security without Trump holding thousands of people's jobs hostage. But McConnell thinks he's a Trump employee, so it won't happen. Trump caused this problem - the House and the Senate agreed in December to keep the government open and Trump agreed, but then some conservative talking head s called Trump a weanie and he changed his mind. What a joke of a president. With the Democrats' rejection out-of-hand of the President's accommodation they may have dramatically overplayed their hand and created in people's minds the, "Pelosi-Schumer Shutdown." Have you noticed how reasonable most, not all, of the comments are regarding building the wall and if it works, fine; if it doesn't, move-on. Perhaps America Media needs to get in touch with reality. There are already barriers/walls along the border. There is no way a wall could be built from sea to sea. Most of the drugs coming into the country come through official ports of entry, not in places where there are no walls. Terrorists come by plane, not by foot over the southern border. More bad guys have been caught coming to the US from Canada than Mexico - why doesn't Trump want to build a northern border wall? There are better ways to protect the border than a medieval wall. Trump has no good reason to build such a wall other than to try to keep his job. Brown: the Last Discovery of America. A book written about race in America in order to undermine ideas about race in America. Paradoxical, mixed, impure - La Mancha (the Stain). The Mexicans (and the Salvadorans, Hondurans, Guatemalans, etc...) are our neighbors. We share much past history and much future relating together. No wall can stop this. The walls are in the hearts and minds of Trump and his hateful, fearful followers. The Pope is right - All Walls Fall. This one as well. Time the Destroyer will bring it down. The Pope’s Catholic wisdom will long outlast Trump’s twitter idiocy. When this and the next couple of Popes demonstrate to the world that they are master administrators and governors and rulers and leaders then the world will sit up and take notice. A light to the nations! Charismatically institutional! Until they have their house in order, OUT house, they should shut up and focus on the task at hand. Choosing presbyters who are suitable to live a faithful life of chastity and obedience, choosing wisely from amongst them according to their gifts for particular tasks and carefully discerning those without significant impediment to invite into the episcopate. Eliminate the aristocratic and archaic Arch-episcopate and Cardinalate entirely. Let all with the anointing and laying on of hands gather together to choose the successor to a dead or resigned post. The old way was designed for walking or carriage riding or a sailing voyage commenced after news of the election being needed was disseminated oh so slowly. Modern telecommunications, modern rapid transport and abundant use of tourist accommodation would seem to make the old ways utterly unnecessary. Mr. Stone----Pope Pius XII is popular among conservative Catholics, but he had the same kinds of scandals, including pedophiles, but no one knew. We do know, however, about Pius XII’s total failure in confronting one of the greatest moral crisis of the 20th century, and that was his failure to publicly confront and condemn the Nazis. Where is the money coming from for this wall? We have to pay back the people who have lost pay because of the government shutdown, not to mention other more important debts. Open the government, then deal with the wall in the normal constitutional manner. Put it to vote in both houses of Congress, then find a way to fund it, if it is authorized. If they come here illegally, they are criminal aliens. If they overstay their visa, they are criminal aliens. I wonder which federal law that an American citizen can violate and be given a pass. I'd choose not to pay taxes for a year if I could choose a federal law to ignore for a one time pass. I do not like criminals. I never have and never will. It has greatly influenced my career choices. I have a friend who is very liberal. Over 10 years ago when this issue was so far beneath the radar and no politicians including Democrats were against a wall, I forwarded a story to him and several others on my email list of friends. It was a joke. It said someone from Texas wanted to go to Mexico and then get caught crossing the border so he could get additional benefits as an illegal alien. My friend sent me a bunch of incredibly hateful stories. I found out that these phony stories were circulating in his liberal community. It was an eye opener as I knew there were equally phony stories circulating in the very conservative community. Being an undocumented alien in the US is *not* a federal crime. Trump's first wife, byw, crossed over to the US from Canada and illegally worked as a ski instructor - maybe she should be deported? Great story about Ivana. She escaped the evils of socialism through subterfuge. I am very grateful to our Church for keeping a protective stance for those oppressed immigrants from other nations. I am tired however, of hearing how Obama was so good to Latinos. He wasn't. He had the opportunity in the first two years of his administration to make substantial changes to immigration laws, to permanently protect DACA. He did not do so. He caused many families to leave the US to keep their families intact because the children are citizens, but the parents are not. I agree we need a bipartisan solution. We didn't get on with Obama. And he and his Secretary of State swept the issue under the rug. Trump is rubbing our partisan noses in it.